Those who know me best know that although I was born and raised in New York, I really don’t like New York. Unlike most tourists, I am neither impressed by, nor in love with, “The City that never sleeps.” But there are some things I like about New York. Each work day, I drive about 40 miles round trip from Queens to Manhattan. The other day, I realized – where else can I travel to work and pass several “landmarks” – LaGuardia Airport, CitiField (home of the New York Mets), the RFK-Triboro Bridge, AND Yankee Stadium. Last week, I was leaving Manhattan around 9 pm, and as I travelled along the FDR Drive, I was reminded of how beautiful New York City is at night. There is something quite amazing about seeing the lights of the City. New York is also home to beautiful bridge views. Working in upper Manhattan, I am also able to view the George Washington Bridge that stands like a soldier over the Hudson River, connecting New York to New Jersey. 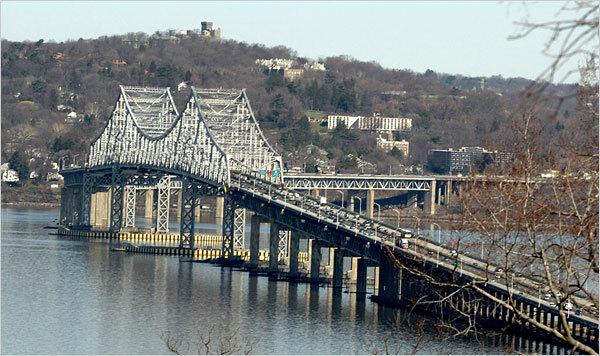 Our church is in Rockland County and so each Sunday morning, we cross the three-mile-long Tappan Zee Bridge, which also spans over the Hudson River. On a clear day, you can actually look 25 miles south and see the NYC skyline. 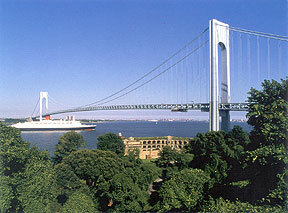 My third favorite bridge is the Verrazano-Narrows Bridge, which connects Brooklyn and Staten Island. I only travel this bridge when I’m on a road trip out of New York, since I usually have no dealings in Staten Island. There is something about looking at this bridge as you approach it from Brooklyn’s Belt Parkway. It just seems to tower over you! Like the beauty of New York City after dark, and the fantastic bridge views, New York also offers beautiful scenic routes, especially during the Fall Foliage season. There’s just something about witnessing the beauty of nature. So although I’d much rather be living anywhere south of New Jersey, I am thankful for these places that help me at least like New York! New York is cool, but I don’t like it much. Primarily because of the trash and traffic, lol. I was just there this past weekend and also had that, oh this is why I do like New York, moment. But my reasons are quite different. I’m so infatuated with the hustle and bustle of the city. The trains keep me in awe, public transportation is like my favorite. I hate driving, even taking cabs, in New York. Even tho I don’t like large crowds, I still get some sort of a rush walking thru Times Square. I love the DC area! Maybe we can switch for a little while! LOL I just enjoy the quietness of the South. I used to work in midtown Manhattan, in an office located in the Empire State Building. It was horrible. Way too many people, and tourists who did nothing but get in my way when I was trying to get to/from work! I despise crowds and I definitely can’t deal with the hustle and bustle of Manhattan. I am clearly a Southern Girl living in a Northern Girl’s body. Give me Southern living any day!